For the first time in Blair's history there are four current and one former ESOL students playing on the Blair football team. One of them, senior Abdula Jah, who is a former ESOL student from Sierra Leone, is the captain and one of the star players. The other players are junior Dinardo Coca from Nicaragua, junior Akmed Jah from Sierra Leone, senior Antoine Diop from the Ivory Coast, and sophomore Carlos Raba from Mexico. Normally international students at Blair take part in the soccer team, not the football team, because soccer is what they grew up with. Calros Raba is the only student in the groupof international students who played football before coming to Blair. Even though he played on his high school team in Mexico, football is not common in his country. There are only about twenty schools playing American football in Mexico, he said. But Carlos hopes to continue playing. "My dream is to go to college football," he added. 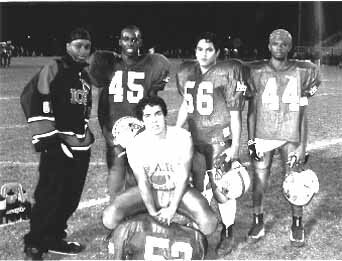 Although most of the other players didn't have any experience in football before coming to the U.S., they have progressed enough to be on the varsity team. At Blair no matter what a person's background is, all are encouraged to take part in football. The coach wants diversity on the team, said Abdula Jah.